Professor Stephen Hawking will play a prominent role in tonight's Paralympic Opening Ceremony, it has been revealed. The theoretical physicist will "narrate a scientific journey of discovery" during the spectacle, which begins at 8.30pm. Sir Ian McKellen will also take part in Hawking's section. Called 'Enlightenment', the show promises a return to the spirit of Danny Boyle's thoughtful, inclusive Olympic opener, rather than going down the pop-stars-and-models-only format of the Olympic Closing Ceremony. The event, to be attended by the Queen, Will and Kate, will feature Shakespearean drama, scientific endeavour, injured soldiers, and a fly-past from pilots with disabilities. 50 performers trained at Circus Space in Hoxton will also tumble for Her Majesty's pleasure, and ours. Hawking is perhaps the world's most famous exemplar of how to achieve great things despite severe physical restrictions. He was given only a couple of years to live (almost 50 years ago) after being diagnosed with a motor neurone disease. 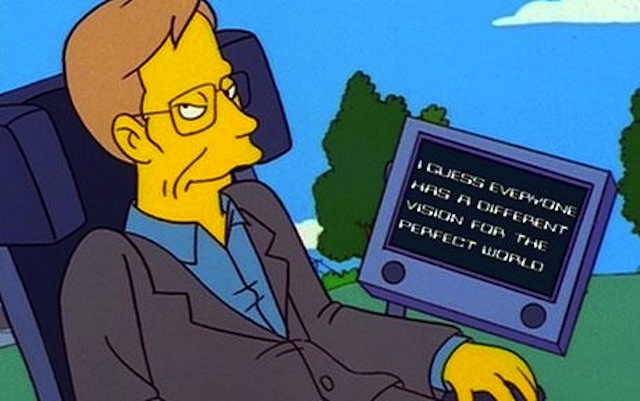 Since then, he's made important contributions to our understanding of the Universe and wrote the best-selling A Brief History of Time, despite near total paralysis.